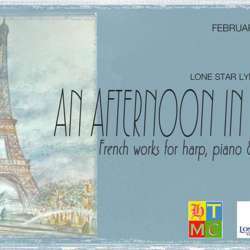 Lone Star Lyric presents the Houston Tuesday Musical Club Protected content AN AFTERNOON IN PARIS. HTMC’s soprano Dominique McCormick, harpist Cindy Qin, and pianist Anne Franc performing French works for soprano, harp, and piano. Dominique will sing Ravel’s Greek songs accompanied by Cindy on harp and Poulenc’s “La dame de Monte Carlo” accompanied by Anne on piano. Cindy and Anne will perform solos on their respective instruments and an original arrangement for soprano, harp, and piano. Admission is free, however, a ticket reservation is required. Seating is limited. Please use the following link to reserve your ticket: Protected content Looking forward to see you!